Well, this is it – the last two projects I planned for my mask book are finished. I think I’ve run out of pages, so one or more of the masks I’ve shown you might not be included – I’ll have to make some tough decisions in the next few days. In fact, in the last post I said only one mask was left to finish, because I didn’t think I’d be able to fit the outlaw into the book – now I’ve decided I like him so much, I’ll fit him in even if I have to leave something else out. 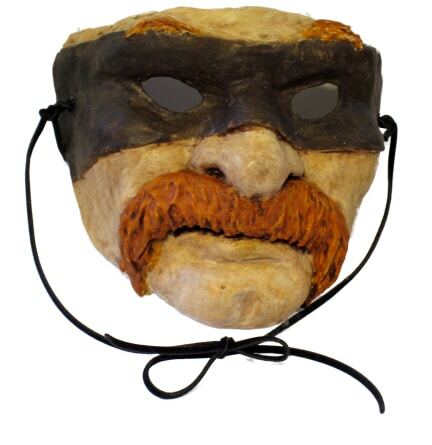 The Texas Outlaw was the first mask I made using the new methods, and it’s the last one I finished. I have a phobia when it comes to painting people, so I kept putting it off. I’m glad he’s finally finished, though – it makes me happy to think of a tough guy with a bright red mustache trying to disguise himself by covering up his eyes. I think this hombre spends a lot of time in the hoosegow. 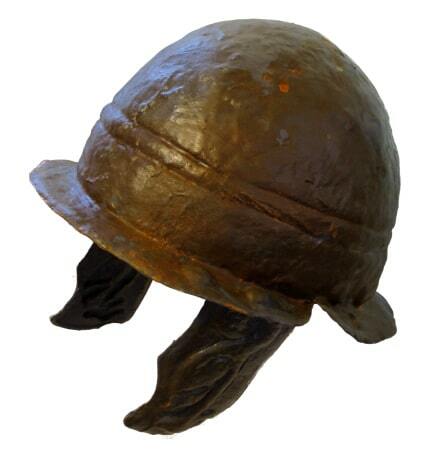 The Celtic helmet isn’t a mask, of course, but I thought it would be fun to see if it’s possible to make paper mache look like rusty iron. (I think it looks pretty authentic, don’t you?) And I did want to create something for the role-playing and military history buffs. I thought I’d need to use more than the usual two layers of paper mache around the rim to get the edge to look thick enough to be believable, but the original photo from a museum collection does show a thin edge on the real helmet, too, so I left it as-is. I bought the Instant Iron and Instant Rust online, so I didn’t read the warning labels until it arrived – not family-friendly stuff. It was fun to use, though. Because of the toxic product, and the non-mask-ness of the helmet, it might be the project that gets bumped from the book. If you haven’t yet “voted” on which mask you think should be on the cover of the new “how to make a mask” book, you can find the other masks here and here. I always value your input. 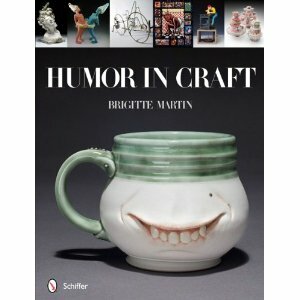 On a completely different note, one of our regular readers and a previous guest poster, Jim Kransberger, is a featured artist in the upcoming book Humor in Craft . Jim’s a busy guy – his work will also be shown, starting tonight, at the Blue Spiral gallery, in Asheville, NC. Congratulations, Jim! Now that I have seen the range, my Number one is the Texas Outlaw, the cat and the duck. But I love them all but that Outlaw, gets you right in the creative mind. You really outdid yourself. Thanks, Christine. After looking through all the suggestions and votes, all three ended up on the cover, and the outlaw is the biggest one. I’ll post the cover in a day or two, and I’d love to read your impact on that, too. Very cool masks, my faves are the outlaw (my vote for your book cover, but like you said, without the hat, he seems to have more character) and the Celtic helmet which is awesome with the iron rust patina! I’ve also been making quite a few masks, some out of paper pulp, some with the layered technique which looks really nice. I made a wall piece of those, that incorporates 5 masks. As usual, I am torn about colour…always the hardest part. Great job on ALL of them and I defininetly will be wanting that book too!! BTW, what do you seal your paper mache pieces with, Jonni? I am searching for something to use. I have been using artist acylic varnishes, but have recently found out that they are not truly impermeable to moisture. Is “hoosegow” another name for jail? Never heard it before! The finish on the helmet does look cool but if the product used to make it is toxic then it would be worth finding another way to do it. I bet you could get similar results (though they would be more time-intensive) builing up thin layers of acylic washes and possibly using metallic acrylics and/or that bronze rub-n-buff stuff or leafing. It is always fun to try new products and technques, though!! I just prefer non-toxic ones if it can be helped. All your work is amazing, keep it up! Can’t wait for the book!